The bamboo shooting is nearly over here. After the initial monsoonal surge, the weather has settled into a pattern of showers rather than tropical downpours. Here is the second of Liya‘s Primal and Paleo-friendly bamboo shoot recipes, for the last bamboo shoots of the season. Bamboo shoot is one of the underrated ingredients which add sparkles to Indian dishes yet remain least used in most parts of India. However, inhabitants of north east India, especially the Nagas, have developed a special love for this exotic ingredient. No wonder you’ll hardly come across a Naga curry or chutney without bamboo shoots in them and their fish curry is not an exception as well. 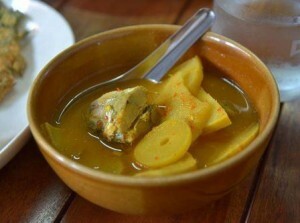 Every Naga household has their own secret recipe to cook this classic dish but all these versions are unified by one dominant ingredient – bamboo shoots or ‘bastenga’ as they are called in Nagamese. The tender, delicate essence of the bamboo shoots receives a zesty complement of the Indian spices, thus making the dish shine. But it’s the pungent aroma of the mustard oil which ties up the flavours together and adds an amazing depth to the dish. But don’t let the long list of ingredients freak you out! This dish is unassumingly simple to cook and could be the ideal choice when you are busy or too lazy to spend hours in the kitchen. Simply cook all the ingredients together and you are ready to enjoy a flavoursome curry for your dinner. Add all the marinating ingredients into a large bowl and stir them all together to mix well. Lay out the fish pieces into the bowl and rub the spice mixture all over the fish; set them aside for an hour to marinate. Drizzle a lashing of vegetable oil into a skillet and heat it over moderate flame. Place the fish onto the skillet and cook them, a couple of minutes per side, until they brown evenly on both sides; drain them out onto a paper towel-lined plate. Heat the mustard oil in a casserole dish until its raw smell disappears. Throw in the onion chunks and sauté for 5-10 minutes or until they caramelize. Stir in the tomatoes and sprinkle the spices on top. 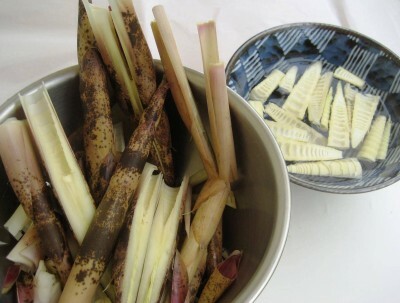 Stir them all together and throw in the bamboo shoots, followed by a splash of water. Place a lid on top and bring the mixture to a boil. Continue to boil for 2-3 minutes and reduce it to a simmer. Simmer for 10-15 minutes and lower the fried fish carefully into the simmering curry. Scatter the chopped shallots on top and cook further for another 5 minutes or until the fish is cooked through. Remove from heat and let it rest, covered for another 10 minutes. Serve hot with Cauliflower rice (or steamed white rice) and fresh salad. This entry was posted in All, Bamboo around the world, Food, Home and Health and tagged bamboo, bamboo maintenance, bamboo shoots, health, India, recipes on 23/12/2013 by Deb.